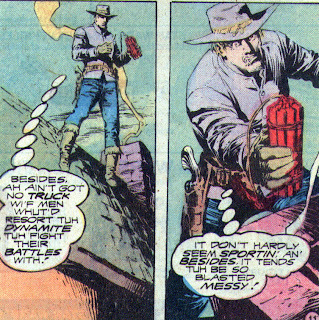 Matching Dragoons: Jonah Hex #33 "The Crusader!" 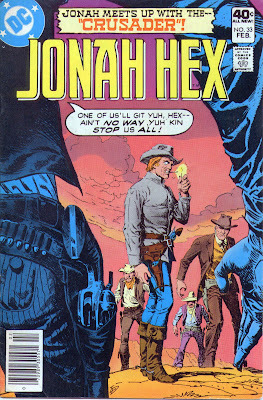 Jonah Hex #33 "The Crusader!" This story starts off with a bang, literally, as Jonah Hex is pursuing the Larson Brothers when he trips a dynamite trap and gets blown to Hell and back. The Larson brothers, riding away hear the explosion and celebrate the death of Jonah Hex. Meanwhile in Shoshone Mills, Mrs. Flannery, a widow, walks up to the local bank. She meets Jeffrey Wilcox, son of the bank president. Jeffrey, on a break from law school, is sweeping the porch and Mrs. Flannery says that she is there to see about getting an extension on her mortgaged farm. Once inside the bank, Mrs. Flannery is running into trouble as Wilcox is sticking to bank regulations about granting extensions. The bank has already granted one extension and that is the limit. Wilcox points out that she is already late with this month's payment so he will be sending the sheriff out to foreclose. He gives Mrs. Flannery until 5 to vacate the property. Mrs. Flannery leaves, a completely defeated woman. She goes back to her farm, her home for 35 years. Seeing no way out and feeling that she has nowhere in the world to go, she decides to leave this world as well. Hours later, Jeffrey runs into his dad's office and announces Mrs. Flannery's fate. Wilcox tells the boy to calm down, the bank has rules and rules have to be followed. Jeffrey is disgusted with his father and storms out of the bank. Later, Jeffrey is speaking with Mr. Ashley (whom we have never seen before) about what happened. Ashley states that he is part of an organization that is devoted to helping people live in equality and justice. Ashley says that he has friends that would agree that what happened to Mrs. Flannery was wrong. He then opens the door and introduces Jake, Morgan, & Al.....LARSON!!!! Jake explains that they want to strike a blow for freedom and dignity and Jeffrey is just the guy to help. Their plan is to take all of the ill-gotten money from the robber-baron's bank in order to return the money to the folks that it was stolen from. Jeffrey is appalled that they want to rob his father's bank, but they remind him of Widow Flannery. Jeffrey turns to Ashley for counsel and Ashley confirms that this is the best way to help the poor. Later that night, Jeffrey knocks on the door of the bank, which is now closed. Mr. Simms, obviously some sort of teller, looks out the window and sees Jeffrey. He opens the door and the Larsons shove their way in and demand the money. When Simms refuses, they gun him down and force another teller to load up the sacks with cash. The Larsons and Jeffrey mount up and head out of town. Later, a posse is being organized and Wilcox grabs his rifle and joins in. 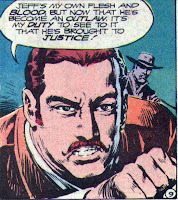 The sheriff protests, knowing that Jeffrey was involved. Wilcox states that even if his own flesh & blood were involved in the robbery, it is his duty to see that justice is done. He mounts up and rides with the posse. Up in the mountains, the Larsons +1 have gotten to the hideout and they are talking about splitting up the money. Jeffrey protests, saying that the cash was supposed to be for charity. The reply? "The Larson family benefit fund!" The Larsons explain that they have a dynamite trap set for the posse and then subdue Jeffrey and tie him up in the cabin and go inside themselves. Inside, the Larson see the dynamite fall down the chimney and rush out in a panic but Jonah Hex is standing out front waiting for them. Jake decides they can take Hex. Morgan Larson decides to turn tale, but Jake shoots him for being a coward and then turns and draws on Hex. Jonah unlimbers his pistols and guns down Jake, Al, and poor Morgan who had the unfortunate fortitude to still be standing after being gutshot by his brother. Jonah goes inside the cabin and finds the bound & gagged Jeffrey. Jeffrey is in a panic because the fuse on the dynamite is getting shorter by the second. Jonah unties Jeffrey and explains that there is nothing to be worried about. Jonah emptied the blasting powder out of those sticks in order to fool the crooks. They get about a dozen yards from the cabin when it blows sky-high. Jonah says he must have forgot a stick or two. Jeffrey jumps onto a horse, he needs to warn the posse and his dad about the dynamite trap the Larson Brothers have set for them in Hitchcock pass. The posse is approaching the pass when Jeffrey comes riding up wildly, shouting for them to stop. Wilcox pulls out his rifle. He is convinced that Jeffrey is trying to scare them away from the Laron's hiding place. He states that he is ashamed of his son and even though he may have raised an outlaw, he would rather kill his own son by himself that stand to watch him be hanged as a common criminal. He takes aim and shoots Jeffrey dead off his horse. Another rider approaches and Wilcox takes aim but the sheriff grabs the rifle from him. The other rider is Jonah and he explains about the traps the Larsons had planted. He tells them that Jeffrey was only trying to warn them. Wilcox refuses to believe any of it and Jonah snatches the rifle from Wilcox, takes aim up into the pass and detonates the trap. Jonah returns the rifle to Wilcox and rides off, leaving the banker standing over the body of a son, murdered by his own father. Men killed by Jonah - I would have to say 3. Even though Morgan Larson was gutshot by his own brother and would have died, Jonah put the icing on his cake. Timeline - Nothing here to indicate much of anything. The whole story seems to take place in one day. For a story that didn't have much Jonah Hex in it, it was still a good story. The man who played by the rules, no matter who they hurt, ends up suffering by his own hand. The gullible hot-headed son pays the ultimate price for his own foolishness. Jonah railing about the trials of his day was enjoyable, especially about the dynamite as he drops it down the chimney. I'm still kinda torn about having the cabin explode after he explains about how safe it is, seemed cliched. 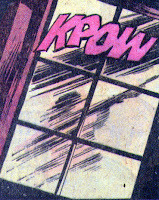 I would put this about in the middle of the pile of all Hex stories, even though it was a big letdown from last issue. Next Issue: Jonah runs into the nastiest politician ever, he helps out a nun, and Santa bites the big one!! It would indeed have been tough to top the last issue, but this is still pretty good. Man, that is one cranky banker! And if the son was attending Law school, he wasn't paying very good attention.